Traffic on the strip is bad and at peak times can be a parking lot, one alternative is the Las Vegas Monorail. Soon after it openned it was closed for many months but is now reopened. The route of the monorail is on the back side of many of the large hotels on one side of the strip. It runs from the MGM Grand to the Saraha with stops also at Paris/Ballys, Flamingo, Harrahs/Imperial Palace, Convention Center and the Las Vegas Hilton. Because its behind most of the properties the stations for most are at the back of the hotels. The fare is $3 for one way or $10 for a day pass or $20 for ten rides or $25 for a three day pass.You buy the tickets at machines on the station platforms or in some casinos it runs daily from 7am to 2am. Trains arrive and depart every few minutes with more at peak times. I use it often because it is air conditioned fairly quick and cheaper than taking taxis. It was privately funded and they originally talked about extending it to downtown as well as to Mc Carren Airport but either is probally years off. 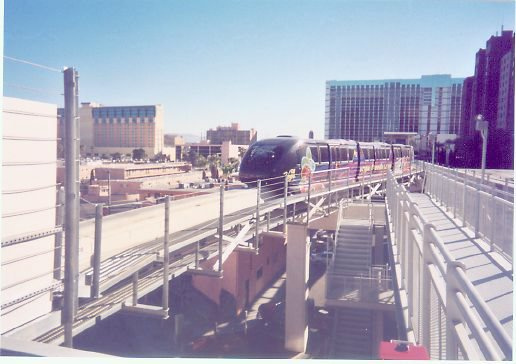 I like staying at the Las Vegas Hilton which is off the strip by the convention center which was a drawback because you would have to take a taxi to the strip but now with the monorail it makes it a lot more conveniant.